A neighbor down the street has a Dragon Fruit cactus (Pitaya) growing against the Oak tree in front of his house. One afternoon, as I was driving by his home, I saw him outside watering the Pitaya and pulled over to introduce myself and “talk plant”. This is what plant enthusiasts do. Even if you don’t know someone, if you start talking plant, you will soon become friends. I was very interested in growing Pittaya because I had eaten the fruit in Vietnam and liked the taste. In fact, I had already begun growing a couple of Dragon Fruit plants from cuttings, but my cacti were still too young to bare fruit. 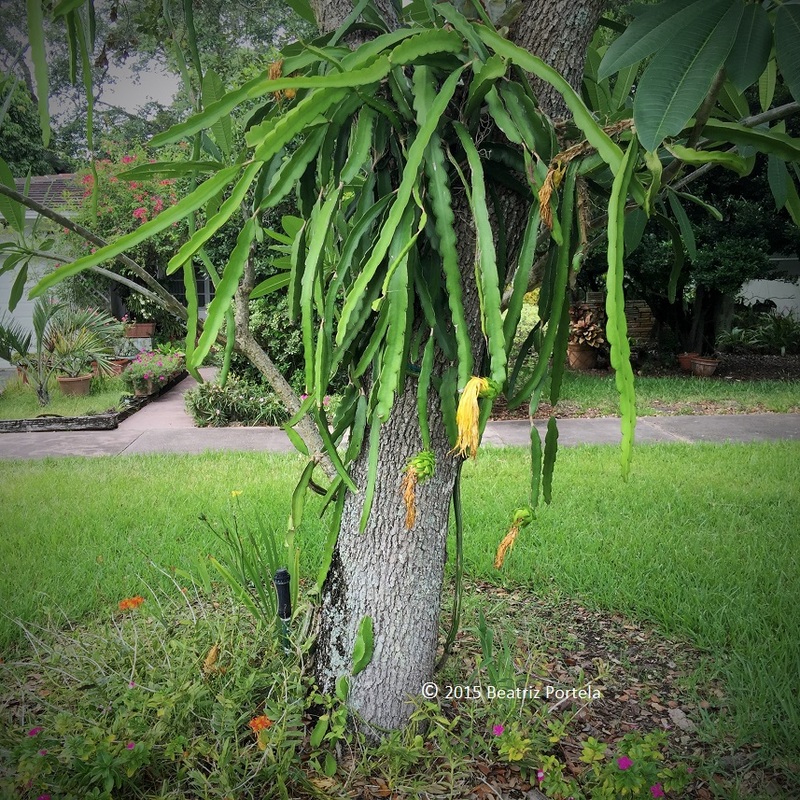 Steve, my neighbor and new friend, told me that he had great success with the Dragon Fruit he had planted against the Oak in the front and other varieties he had planted elsewhere. “The best varieties are in the back yard” he said, “I don’t want people seeing them and taking the fruit.” Steve then proceeded to explain how he went out to his yard at night–since Pitaya only blooms in the evening–and would hand-pollinate the flowers so that he was assured of a good crop of fruit. Wow, this guy is a fanatic! How do you even do this pollinating thing?! I pictured him approaching the plants in the dark, with a headlamp or night-vision goggles on, then performing this complicated thing on the unsuspecting flowers. Or maybe his wife was his partner-in-crime, holding a flashlight while he did THE PROCEDURE… These people are experts. I’ll never do anything so extreme. My plants better figure out how to pollinate themselves! “To ensure fruit production, plant 2 or 3 different genetic types (not the same clone). Cross pollination between the different types in the planting will assure a better fruit set and size. Moths and bats are good To ensure fruit production, plant 2 or 3 different genetic types (not the same clone). Cross pollination between the different types in the planting will assure a better fruit set and size. Moths and bats are good pollinators, since flowers open at night when there is no bee activity. All species inter-pollinate with each other., since flowers open at night when there is no bee activity. All species inter-pollinate with each other.” Wow! Great posts! I am enjoying reading your plant adventures! Thanks, Liz. I did actually plant two types together so they can get down to business without my help! A plant matchmaker! I love it!